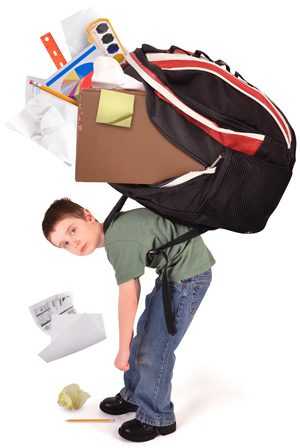 Are Your Children Carrying a Heavy Academic Load? 1. Make sure the backpack is sturdy and appropriately sized. Special child-sized versions are lighter and have shorter back lengths and widths that reduce shifting. 2. Look for padded shoulder straps to avoid nerve pressure around the armpits and shoulders. Select backpacks with waist straps and make sure they’re used. 3. The maximum weight of loaded backpacks should not exceed 15% of the child’s body weight. If the pack forces the child to lean forward, it’s too heavy. Bring your child in while fully loaded for school. We’re happy to provide an evaluation and offer suggestions for reducing spinal stress. We love the opportunity to help prevent some of the often difficult-to-correct problems we see in adults! Serving the chiropractic needs of Westminster, Finksburg, Manchester and Hampstead, MD and surrounding areas.